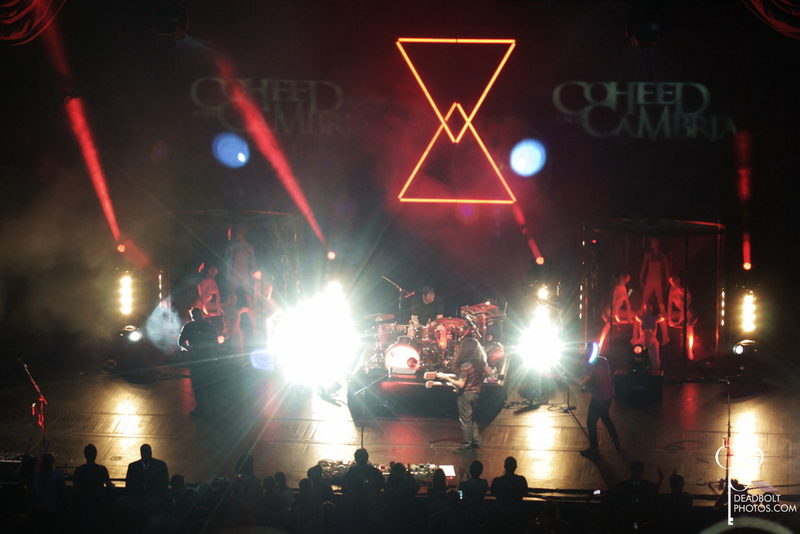 Coheed and Cambria in NYC! It has at least been several months of me looking forward to this show. 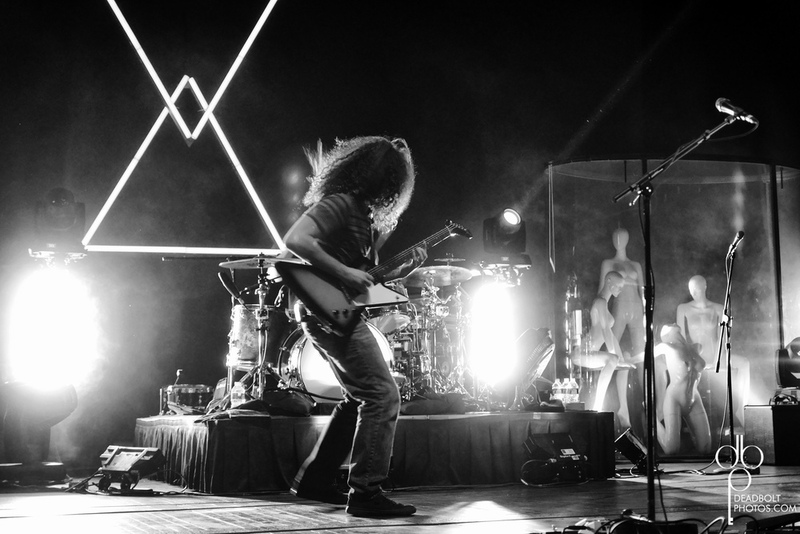 Coheed and Cambria has been a band I have loved for a long time, and I couldn't wait to shoot this show. On top of everything else, they were playing at the world famous Radio City Music hall. I knew it was going to be epic. Friday night, March 16 finally rolled around, and I head to NYC. Claudio and his wife played one song before the show really started. Russian Circles opened the show. I had never heard of them but beforehand I heard that they were good. They ended up being an instrumental band, which I wasn't expecting. The music was beautifully done but for me, it is hard to hold my attention if there are no vocals. That is just me though. The 3 guys on stage sounded great together. I will say that their choice of lighting made it hard for me. They literally had like 3 work lights behind them, and 2 light bulbs. Made shooting nearly impossible. But those are just some photographer problems. Between the Buried and Me were next up on the bill. I know a bit about them so I was a little interested in seeing them play a place like Radio City. They came out all wearing suits, keeping it classy for NYC. The suits did not stop them from playing a brutal set though. They attacked every single song furiously and the audience loved all of it. Any quiet moments were met with chants of "BTBAM!" over and over. Personally thinking, BTBAM did a good job of keeping everyone on their toes. Just when you thought Tommy Giles' voice was going to explode out of this throat, the band would bring everything down quietly. Interjecting a piano part that you didn't see coming. They definitely got the crowd hyped for the headliner. And then it was time for Coheed. Since releasing The Second Stage Turbine Blade in 2002, this band has been surrounded with so much myth and legend, I couldn't wait to see them take the stage. Before the band took the stage, two huge enclosed containers filled with mannequins were revealed. And then the neon triangles were revealed behind the drum kit. By the time the intro music came on for the band, every person in the building were on their feet. The band opened with Pretelethal from their new album The Aftermath: Descension . The songs starts off pretty delicate before exploding a bit in the middle. Which is a good way to describe the band actually. At times, they are so soft and beautiful. At other times, the sheer force of their music makes your heart want to beat out of your chest. The best of all of it. Claudio Sanchez has one of those one of a kind voices. Even after seeing him sing live sometimes you can't believe what he is able to do. On stage he is a swirl of curly hair and jumps. Absolutely fantastic. Travis Stever sounded great on guitar and backing vocals. All the while Josh Eppard and Zach Cooper kept it all rolling on bass and drums. Their set list danced around all 7 of their albums, making sure to have lots of highs for everyone in building. Favorites like A Favor House Atlantic, No World For Tomorrow, Here We Are Juggernaut, and The Crowing were met with much screaming. Newer songs like Vic The Butcher, Dark Side of Me, The Aftermath and Goodnight, Fair Lady were not any less impressive live. When someone can hold your attention from the first time you hear a song, that means a lot to me. Coheed killing it in NYC. The band took a very short break and then returned for the one two punch of the amazing Domino The Destitute and my personal favorite: Welcome Home. That song never fails to get me fired up and Claudio even broke out the double neck guitar for this one. There is a part of me that is glad it took me 10 years to finally see Coheed play. I cannot imagine a better place to see them play than Radio City Music Hall. Literally days after Claudio's 35 bday, I am sure these NY natives felt the same way. If you have never been, Radio City is absolutely stunning. Coheed came and brought it to another level with the lighting, showmanship, and incredible music. I feel lucky to have been there. I will be posting more pictures on my facebook and flickr pages. Also, follow me on twitter and instagram. Post this review everywhere. Thanks for the continued support.